Alice is looking for a Christmas Miracle! 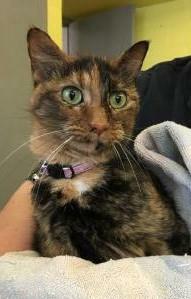 Alice is a very sweet girl who came to us from a kill shelter. She is glad that her life is safe, but she’d like to really start living. Some of the other cats intimidate her, so she shy’s away from them, but she comes over for love from every human who walks into the room. She is a sweet, quiet girl who would love to call your home hers. She has a love for children, and will seek them out for attention.